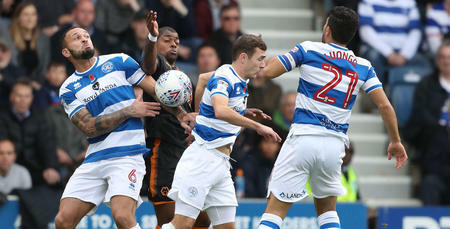 TEN-MAN QPR slipped to their second defeat in a week, as Wolves struck twice in the second half to earn a 2-1 Sky Bet Championship victory at Loftus Road. In front of the live Sky Sports cameras, James Perch’s 35th-minute dismissal – following a late challenge on Matt Doherty and subsequent second yellow card – made life very difficult for Rangers. And the visitors duly took advantage after half-time. It was a first win in 10 for Wolves, who led come the 60th minute when Dave Edwards applied the finish to Doherty’s cross from the right. And a crucial second goal arrived for Paul Lambert’s men seven minutes later, as Helder Costa struck with a stylish solo effort. 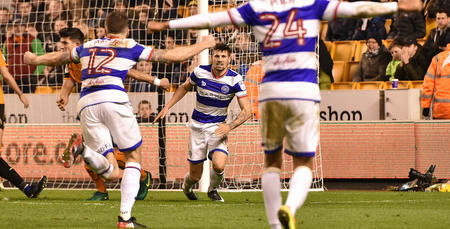 Joel Lynch’s 90th-minute strike gave the R’s hope but, despite some seven minutes of added time, Wolves held on for victory. Rangers boss Ian Holloway made three changes to his side, following last weekend’s 3-0 reverse at Ipswich Town. Both Jack Robinson and Massimo Luongo were restored to the starting XI after injury and illness respectively, as was Sandro on the back of his substitute appearance at Portman Road on Saturday. So out went Jake Bidwell, Jordan Cousins and Karl Henry, who all began from the substitutes’ bench. Though clear-cut opportunities weren’t exactly free-flowing in the opening stages – on what was an uncomfortably-cold west London evening – it was the home side who asked the greater questions. In the sixth minute, Tjaronn Chery’s low drive shot just past the foot of the right-hand post while, four minutes later, Grant Hall’s cracking drive from a corner saw Wolves skipper Danny Batth produce a brave block. The visitors enjoyed a bit more possession after that – and Rangers had goalkeeper Alex Smithies to thank for a superb stop in the 21st minute. Wolves’ Ivan Cavaleiro made space to cross from the left and, when he picked out Costa on the opposite side of the box, his sweetly-struck volley forced Smithies into an excellent low save. Two minutes later, the R’s also went close. Skipper Nedum Onuoha crashed an effort just over the bar, following Robinson’s left-flank centre. But Rangers’ task was made all the harder in the 35th minute, when Perch was sent off for a second bookable offence. After seemingly being booked for dissent earlier in the first half, a mistimed challenge on Doherty was enough to bring Perch’s evening to a premature end, as referee Tim Robinson produced a yellow and subsequent red card. An almighty blow for the home side and, only three minutes later, Wolves should have taken the lead. Costa’s inswinging centre from the right was to a tee for a leaping Edwards, whose header looped just inches wide of the near post. With just over five minutes now remaining in the opening period, Hoops boss Holloway was no doubt eager to see half-time and, thankfully, Rangers managed to remain level when the referee’s whistle was eventually sounded. Holloway made a change at the break. Conor Washington made way for Yeni Ngbakoto. A man light, QPR would probably now have to take risks in an attempt to win the game. So an interesting second half awaited. The R’s didn’t look like a side with a numerical disadvantage at the beginning of the closing period. Rangers largely kept the ball well, enjoying the better of the possession, too. Wolves did break on the hosts in the 56th minute, however. Fortunately, Cavaleiro couldn’t pick out a waiting Nouha Dicko in the box. But the visitors would eventually take the lead on the hour mark. Doherty picked out Dominic Iorfa down the right, and when his cross leapt up into the path of Edwards, the Welshman lashed a half volley into the top right-hand corner from 16 yards. Five minutes later, both Wolves and Edwards so nearly had a second goal. Rangers custodian Smithies fashioned another great save, flinging himself to his right to keep out Edwards’ glancing header from a cross. However, goal number two would soon arrive. It was a fine piece of individual skill from visiting winger Costa in the 67th minute. The Portugal Under-23 international danced his way past three challenges in the penalty area before driving low beyond Smithies. Another hammer blow for the R’s – and, despite introducing Idrissa Sylla for Seb Polter straight after that goal, Holloway’s men couldn’t ultimately recover thereafter. Wolves had the opportunity to be home and hosed 11 minutes from time, though again, Smithies produced yet another smart block – this time keeping out Doherty on 18 yards when Lambert’s side pressed forward in numbers. The QPR ‘keeper also saved well from substitute Jon Dadi Bodvarsson two minutes from the end, to keep the score at 0-2. Lynch’s close-range strike in the final minute of normal time – following a trademark long throw from full-back Robinson – signalled a grandstand finish. And it was also Lynch who squandered a glorious opportunity to draw Rangers level in some seven minutes of injury time. However, as the game vigorously swung from end to end at the death, the R’s couldn’t quite find an equaliser. HIGHLIGHTS from QPR's Sky Bet Championship match against Wolverhampton Wanderers at Loftus Road.